the forecast for today was supposed to be warm (high 70's) and sunny. so far it's been slightly chilly and cloudy. but that hasn't kept me from thinking about warm weather and the vacation days to come. most specifically, our annual trip to oglebay in west virginia, and how sam is going to be in need of a bathing suit for all that playing in the pool. yay! i really like this one at baby gap. 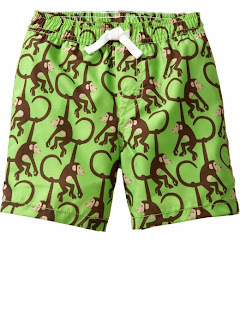 i can never resist monkeys, and we still have a gift card to use…if only i knew what size to get…sam is growing like such a weed (wearing 3-6 month old pants already)!